To initiate a purchase or custom order, please contact us by e-mail or phone to verify availability, shipping information and other details. 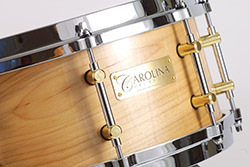 Carolina Drumworks must receive payment or deposit prior to accepting the order. Custom orders: Orders for snares and single drums require a 50% deposit prior to the start of production and the balance plus shipping charges, if applicable, upon completion and prior to shipping. Orders for kits require a 50% deposit prior to the start of production, a 25% payment halfway through production and the final 25% plus shipping charges, if applicable, upon completion and prior to shipping. We will provide a written quotation on your order, and your approval in writing (e-mail or letter) is required. Deposits and progress payments are nonrefundable once work has commenced. Failure to make final payment within 30 days of notification of completion will be considered cancellation of the order. Normal production time for individual drums is 12 to 16 weeks; we will notify you of any delays beyond that period. Stock drum purchases, including any applicable shipping charges and tax, must be paid in full prior to shipment or delivery. Payments are accepted through Paypal or by money order or cashiers check. Personal checks are also accepted but payment will not be considered received until funds have cleared. A Paypal connection is provided on our website for your convenience and purchases may be charged to your major credit card if you have established that arrangement for your Paypal account. Our drums are warranted against manufacturing defects for one year from the date of delivery. Custom orders are not eligible for refunds or returns. Other items must be returned in their original condition, showing no signs of use, within 30 days of original delivery, and are subject to a 20% restocking fee. The item must be complete and in its original packaging free from damage, marks or scratches of any kind. Refunds are only for sale price less restocking fee and NC sales tax if applicable. Shipping is not refundable and return shipping charges are the customer's responsibility. Purchases in North Carolina are subject to 6.75% sales tax.